Mobile Patrols vs. Courtesy Officers: What's The Best Option? Are courtesy officers the best security option for your community? There are added benefits to having a courtesy officer as your main source of security. Typically, courtesy officers are living on-site with the ability to respond in a moment's notice, and are off-duty police officers. While courtesy officers do provide residents with peace of mind knowing they are on-site, how effective are they when it comes to deterring crime in your community? More times than not courtesy officers operate in a reactive manner to criminal activity that occurs. They are not actively searching for crime happening on-site, rather they're only acting when a resident comes to them with a particular issue. When that happens, the courtesy officer will most likely pass it along to law enforcement officials on-duty. 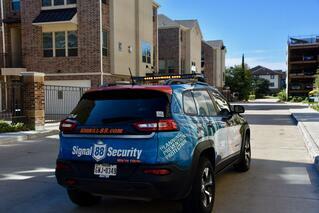 Signal 88 provides proactive security services. With patrols coming on-site as much as four times on a given night, our officers are actively searching for potential signs of criminal mischief. And, whereas a courtesy officer only has the ability to cover a certain amount of area within a certain amount of time per night, Signal 88 Security's mobile patrols have the ability to cover the entire community. Moreover, each Signal 88 vehicle is branded with reflective graphics, and LED lights that create a high security presence and act as a deterrent to any criminal activity that may be taking place. Furthermore, each security officer is required to provide a full-scale, detailed report of their patrols each night regardless of where an incident took place. As a result, this creates transparency and accountability with our officers and our services contracted with you. Courtesy officers offer a convenient form of security for your community. But by taking the next step and hiring an outside security firm, you're providing residents with greater peace of mind.